Hi there! My name is Stacie Lang and I currently reside in sunny Arizona with my husband of 10 years and our 3 daughters. I’m a homebody-at-heart and very inspired by nature, which you’ll see in our designs by way of earthy colors and easy, comfortable silhouettes that can be dressed up, dressed down and loved for years. Suunday is a women’s clothing label that features simple, high-quality pieces that are easy to wear and easy to love. We’re passionate about effortless, uncomplicated designs that make you feel your best while doing what you love. For the last three years, I’ve owned and operated a children’s clothing line called Alice + Ames. It took lots of hard work and research finding the best domestic manufacturer, fulfillment center, mills and dye houses, etc., and once we felt like we finally had talented, trustworthy contacts in the industry, I made a rash decision one Sunday morning to start making clothing in a size that I could wear. Six months later, Suunday launched. While everything is ethically made in small, thoughtful batches, we still try really hard to maintain affordable price points whenever we can in an effort to contribute to the slow fashion movement. People are becoming more and more aware about where and how their clothes are made, but sadly it’s not financially realistic for everyone to shop small all the time. We understand that, and are trying to create more opportunities for women to shop sustainable when they can. While our company is only 6 months old, we have big plans of expanding our styles, inventory, and sizes to accomplish that. 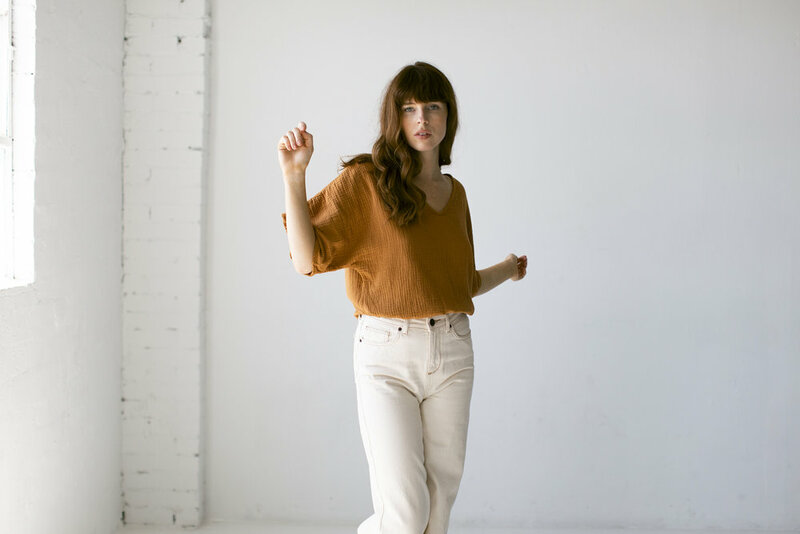 My favorite Suunday product is definitely our Gauze Dolman Top (restocking this holiday!). It’s comfortable, it’s flattering, and it transitions so well from day to night. But ask me again after our SS19 collection drops.